Well the batch of homemade lap cheong is ready to eat. I had tried a little a day for the last few days, I am still here no funny tummy or illness. I am now happy to declare they are safe to eat. Total drying (hanging) time is 1 week at room temperature. After drying the weight loss is around 30%. The outside of the sausages was a little drier and firmer than the inside. So I put them in a plastic bag and leave on the counter for couple of days it seems to do the trick, the sausages firmness has even inside out. They looked great dark plum in colour with bits of fat meat showing. Smell. After hanging for a week, they don't smell a lot. But after I put them in a plastic bag for few days (if the weather is warm leave in the fridge), the nice smell has come back. Taste: Very nice like the real thing. I am confident to say they taste better than any lap cheong I had bought in UK. I may add a bit more spices and wine next time. The lean meat has shrunk a lot more than the fat meat. I think the fat meat is a little on the high side. Next time I will reduce it to around 28 - 30% : lean meat. The artificial skin tastes ok and tender. I have no problem with it. The only problem I had is it tears or splits quite easily during stuffing. So for the next batch I will definitely try natural skin. To keep. In fridge or freezer. If you want to keep them for longer than 2 - 3 weeks, best in freezer. I don't really know if it will go mouldy/turn racid if you leave it in the fridge for too long. I steamed some (whole) lap cheong yesterday for around 20 minutes then sliced diagonally. 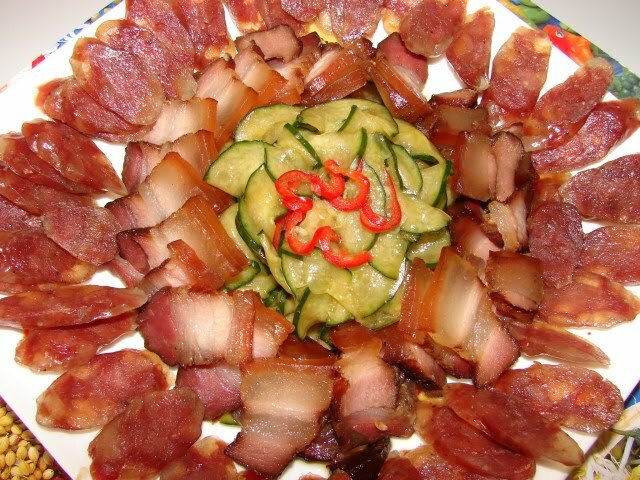 Here is the picture I had it with homemade lap yuk and pickled cucumber. This sweet and sour cucumber cuts the richness of the meat and tastes good too. Steaming plumps up the sausages a bit. It's very tasty and tender. The colour is spot on. 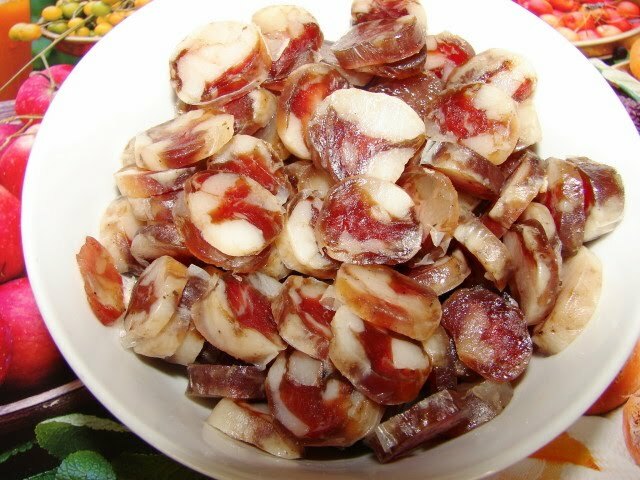 Here are uncooked sausages sliced for fried rice. You can see they are quite fatty. 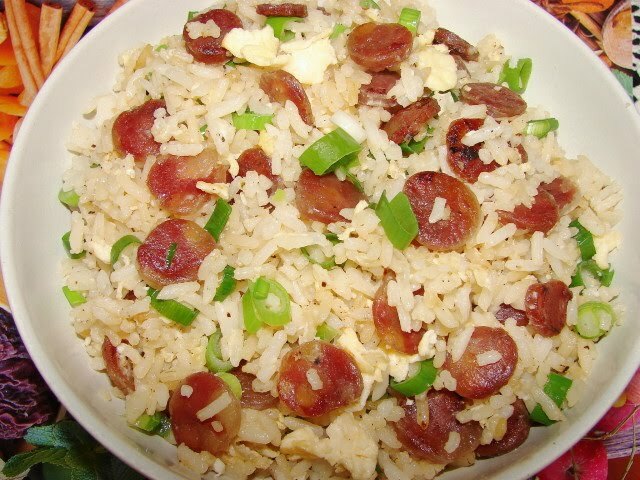 Here is the fried rice. Lap cheong fried rice is one of my quick and easy favourites. Now I can have this anytime without worrying the lap cheong can be quite expensive. Stir fry the lap cheong till lightly brown and some fat is oozing out. Stir in the garlic and add the rice. Stir fry till rice is piping hot. Add dash of light soy to taste. Push rice to one side and add beaten egg in the centre and scramble till set. Stir in the rice and mix, stir till fragrant and evenly mixed. Finally add pinch of ground pepper, dash of sesame oil and stir in the spring onion. I have never made any sausages before. I am so thrill this batch of lap cheong has gone so well. I can see I will be making them regularly from now on. I can't wait to use the stuffing attachments I received last week. Don't think I will ever buy another lap cheong again. 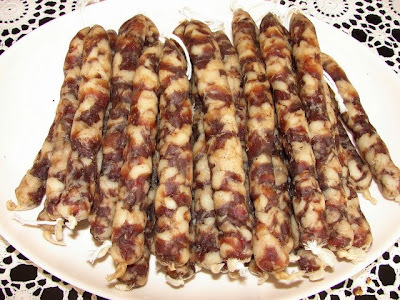 There is no worry what other preservatives the store bought lap cheong have. I will play with other flavourings, spices, meat texture and using other type of meat. I am already thinking maybe I can make some liver lap cheong. The other thing I like to try is to smoke them. I don't have a smoker will have to think of a cheap way to do it. It's worth it. Give it a try Lily. Congratulations, Sunflower. This post along with your recipe will be my reference. Thank you again for sharing the experience. I don't know why your sausages turned soured did you use ready ground meat from the store or butcher? Also was the room temperature where you hung the sausages warm? If you want to smoke the sausages you will need a cold smoker, can be an expensive set up or equipment to buy.